Velvet center with gimp lattice; animal sides. Finished with cording and tassel fringe. With floral center and ruched silk sides. Finished with beaded velvet ribbon trim and fringe. Floral fabric is woven of viscose/cotton/rayon/polyester. Dry clean. Made in the USA of imported fabrics. 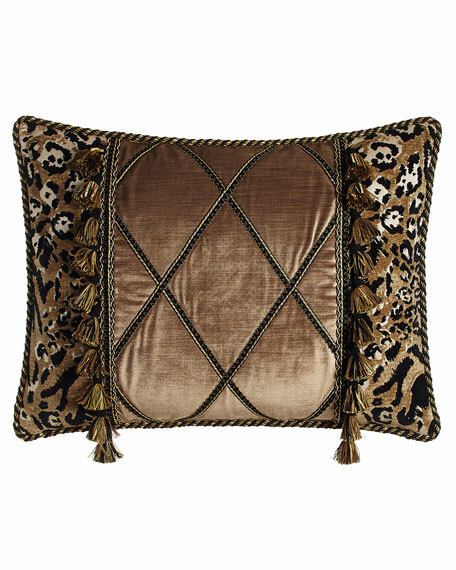 Plisse-damask center is woven in Europe; ruched velvet corners have tassel trim. Cotton/polyester/viscose/silk with polyester backing. Dry clean. Made in the USA of imported fabrics. EXCLUSIVELY AT NEIMAN MARCUS Floral jacquard sham. Ruched velvet piping. Front: viscose/cotton/polyester. Back: polyester. Zip closure. Dry clean. 19" x 35". Made in the USA of imported materials.